As expected, we didn't wait long for a trend change. 2 out of three signals flipped last week, so we start the week of May 13th in an uptrend. 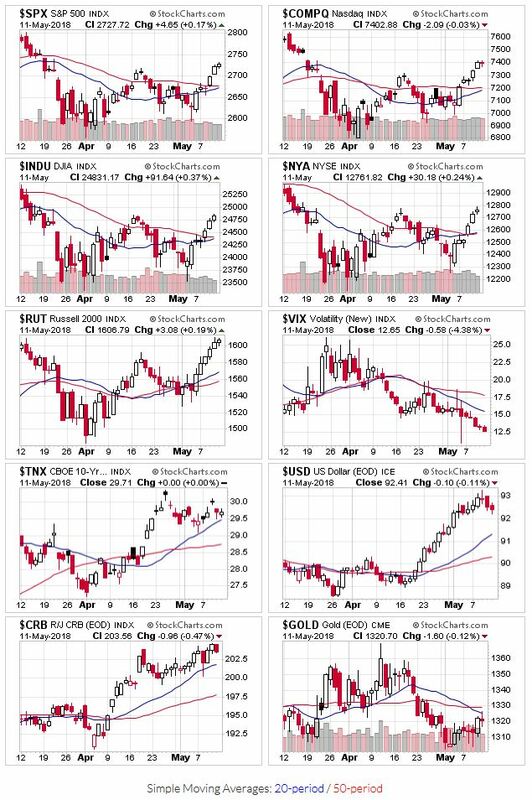 With the Russell 2000 leading the way, all the major price indexes are above their 20 and 50-day moving average, which puts this signal back in the green, so to speak. Last week's rally above the 50-day moving average wasn't accompanied by higher trading volumes, which doesn't instill a lot of confidence in the current rally. 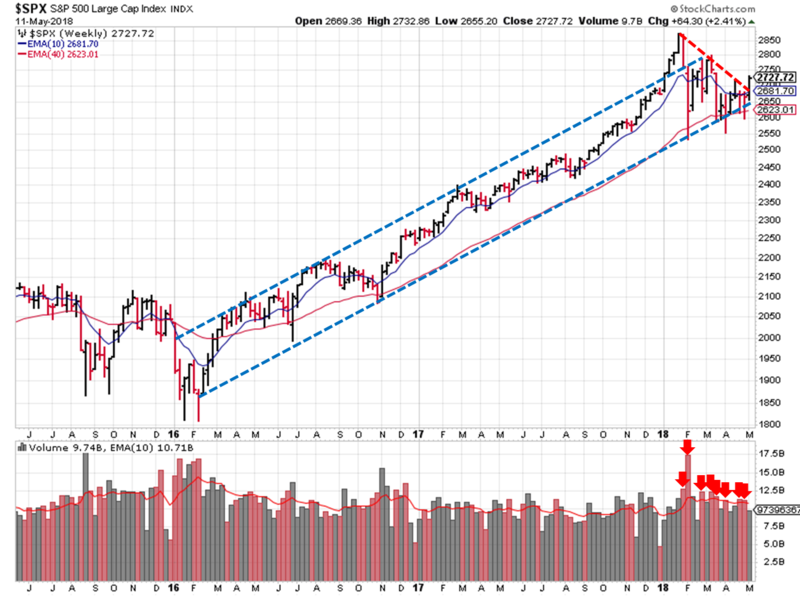 I expect a retest of the 50-day before we really get going, if we really get going, so this indicator remains mixed. OEW flipped to an uptrend last week. The descending triangle pattern I've been tracking ended last week, as prices crossed the upper trendline. Support held at the 200 day and at the 2,581 price level. The ADX indicator switched over to the bullish side, though it shows a weakening trend (aligns with the falling trading volumes as we rallied above the 50-day moving average). 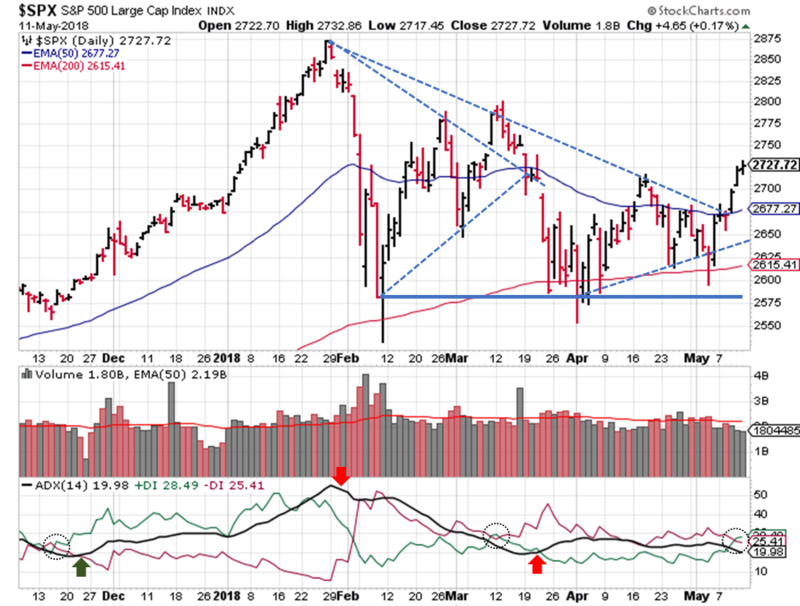 If past is precedence, we'll have to wait another week before learning whether this rally will hold; we could even see a new descending triangle form. Take a look at the March timeframe in the chart below. We broke above an upper trendline, and within 7 trading days the S&P was looking for support. The breakout was on lower trading volume, and the ADX showed a weakening trend (similar to the current breakout). Hopefully, we'll see a confirmation soon (late December), rather than a head-fake (mid-March). The lower bound of the long term price channel continues to hold, and the S&P broke through the downward sloping trendline limiting advances since March. A solid earnings season could only be held back for so long. However, even with that fundamental strength, we haven't seen higher trading volume for positive weekly closes since January (!). My watch list isn't exactly setting the world on fire at the moment. Growth stocks are breaking out, but those breakouts leave a lot to be desired (proper set-ups, trading volumes, etc.). Income plays have and continue to be under pressure from Fed interest rate hikes.